Beer Fellows: Flying Fish in the Shipyard! A look at two northeastern summer seasonals. Flying Fish in the Shipyard! A look at two northeastern summer seasonals. We are still battling the heat out here, though a respite comes tomorrow. I have to admit I really don't like the heat, once it gets above 85 degrees I would prefer to shut down and do a whole lot of nothing. There is an exception to this, if I am on a nice sandy beach, breeze blowing off the ocean, resting in a chair with an umbrella, a beer in one hand, and a gin and tonic chaser in the other then it can be 90, 100, 105 degrees, I'll be just fine, otherwise give me cold day any day. That said, the real reason we are here tonight is to continue looking at a few summer seasonals. 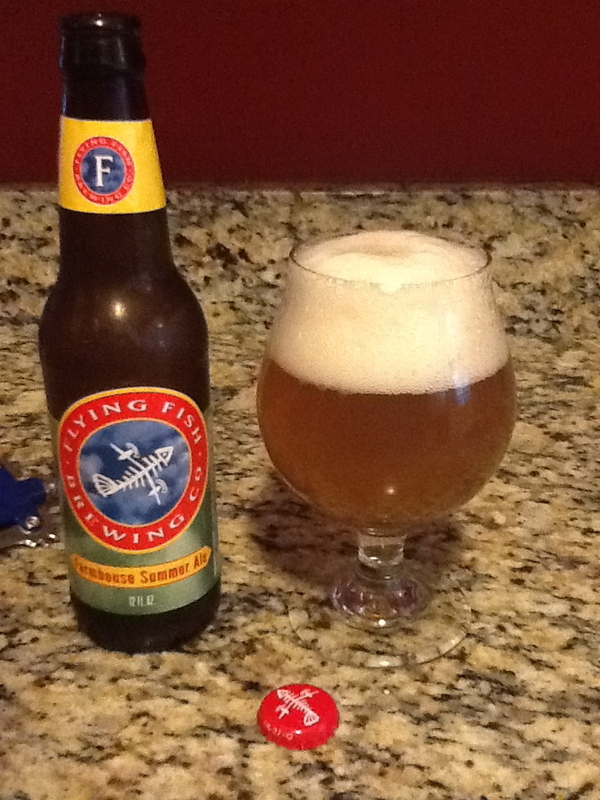 Our first candidate is Farmhouse Summer Ale by Flying Fish Brewery out of Cherry Hill, New Jersey. It poured a hazy golden color with a big, fluffy, white head that slowly settled. There was a lot of particulate swirling about, finally coming to rest at the bottom of the glass. This had a nice crisp bite up front with good carbonation. It was effervescent, fruity, and light on the tongue with some mild bitterness and faint grassiness in the aftertaste wrapping up with a dry finish. Overall it reminded me of a lighter version of a comes of as a lighter version of a saison, which isn't a bad thing particularly on a hot day. This beer is a decent summer drinker that I would use for a more "formal" summer party. I think this has the potential to be a really good cheese beer. It comes in at a refreshing 4.6% ABV. For my first Flying Fish experience it sets a pretty solid standard. I'm pretty happy with the result. 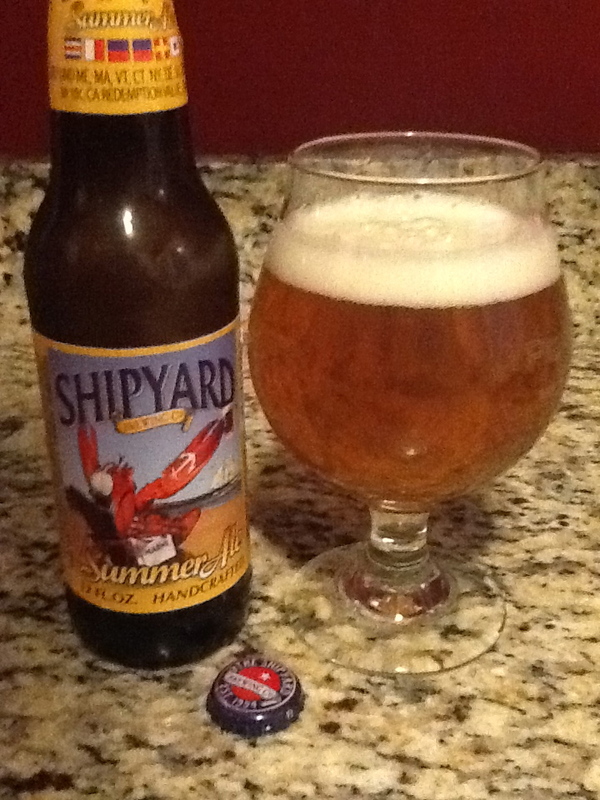 Our other candidate for the night is Shipyard Brewery's Summer Ale from Portland, Maine. This is a pale wheat ale, the American craft brewers' go to style when brewing up a summer seasonal. This poured a clear dark golden color with little head that quickly disappeared. This is bigger in taste than other summer seasonals I have had. It reminds me almost of a lager in the way that it has a larger body. It clearly is punching above its weight class here. There is some faint fruitiness and a flat taste of wheat, fair carbonation, with a lingering but small bitterness in the aftertaste which hovers in the background for a good while after then drink. It is an all right brew but doesn't really do anything to standout from the crowd other than be more filling and bigger bodied than other summer seasonals. That isn't necessarily a good thing on a hot summer day. It comes in at a smooth 5.1% ABV. Shipyard Summer Ale is a traditional American wheat beer. With its inviting golden color, mellow malted wheat flavor and less hoppy characteristics, it’s sure to please those looking for a clean, cool taste sensation on long, hot summer days.